…Woke up to the continuous sound of Underground trains. Walked across the high walkways. They’re all glassed in with holes in to look out. When I looked out I got a face full of wind and rain. Went to HMV and Marks and Spencers. Went to the station and got train to Loughborough. We had stayed with an old friend of my mum’s who had a house in Islington. The bedroom in which me and my sister spent the night directly overlooked a railway line. Whenever I read or see an adaptation of the Sherlock Holmes story The Bruce Partington Plans, I am reminded of this bedroom. However I realise now that I can’t have been hearing Underground trains, for there is no Underground line that runs above ground through Islington. 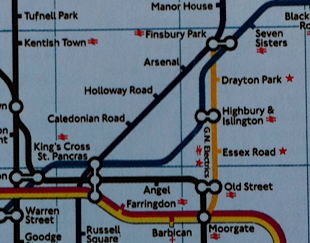 It must have been either what’s now the Overground line running between Highbury and Islington and Canonbury, or the mainline north from Moorgate which surfaces just before Drayton Park station on its way to Finsbury Park and beyond. Anyway, whichever trains were running on whichever line I listened to on this day 25 years ago, the occasion was a formative one. It was my first experience of lying in bed and hearing a train pass by: a sensation that is surely one of the most evocative and sentimental there is, albeit one that faces stiff competition from lying in bed and hearing the sound of rain falling. Or, I suppose, simply lying in bed. The remainder of our trip to London sounds empty of anything approaching this kind of excitement, although that might be due to my second and equally doomed attempt to write a diary entry in the style of a pithy intellectual. I do remember being absolutely blown away by HMV on Oxford Street. I couldn’t believe so much music was all in one place. In 1986, this meant more to me than a “face full of wind and rain”. …Going once again to London to stay a night [with an old friend of my mum]. Set off at 9.34am on a bus to the station. 12.40pm got off train at London St Pancras. Oh dear. I think this was an attempt at “genre” diary writing. A somewhat half-arsed one, admittedly, but an attempt none the less. It’s a rip-off from, or rather a homage to, the entry in The Growing Pains of Adrian Mole for Tuesday 29 March 1983: the one where he runs away from home. I remember being much taken by the idea of writing entries like an itinerary. Away with the need to construct proper sentences! Away with the fuss of having to come up with stuff for an introduction and a conclusion! These things write themselves! The upshot in my case was tedious and charmless in the extreme, and I didn’t persist with this approach beyond the family trip to London. Which, as you’ll see, extended for precisely one more day. Many years later I made a slight and knowing return to the concept of list-based diary entries, but that was when I knew a bit more about all the things I pretended to know about in 1986: genre, language, self-deprecation and, indeed, writing. Meanwhile it’s interesting* to see it took two and a half hours to travel from Loughborough to London by train in 1986. The fastest service nowadays takes one hour and 20 minutes. …Slept well at Granny’s and got up at 6.50am to watch Breakfast Time. Stayed at Granny’s until 9.30am when Mum came to take us shopping. I earned 20p again in Sainsbury’s for helping Mum. Eventually arrived home at 12.15pm. This, then, was my summer holiday. Getting up earlier than usual instead of later. Spending more time, not less, in front of the television. And earning a little more than usual, but barely enough to buy the latest 7″ single I had my eye on: the BBC’s official theme to the Commonwealth Games, by BA Robertson. Indeed I would have to wait until the Games were over before I had enough money to splash out on what history has revealed to be one of the dreariest signature tunes ever committed to disc. I don’t think I particularly minded that this long hiatus from school had subsided into such low-key, solitary fare. Our family didn’t live somewhere close to bountiful acres of countryside through which I could have skipped and foraged in some Blyton-esque reverie. Nor did we live in a street where children played out all of the time and neighbours leaned over each other’s fences and cooled pies on their window sills. Like with most aspects of my life in 1986, I didn’t know any different, so I didn’t think anything was wrong. …Yes, the events of the Commonwealth Games began with Bowls, Boxing, Swimming, Shooting, Weightlifting, Rowing and Cycling on today’s menu. Bought a book called Guide to the Commonwealth Games by Desmond Lynam this afternoon. It was £3.95. Started filling in the results which was a squash. Somewhere down the years I lost this book, which is a shame as I remember it being quite a thorough effort by the BBC – sorry, by “Desmond Lynam”. In order to keep the book up to date, for the first and possibly last time in my life I made a point of sitting down in front of the television to watch a game of bowls. 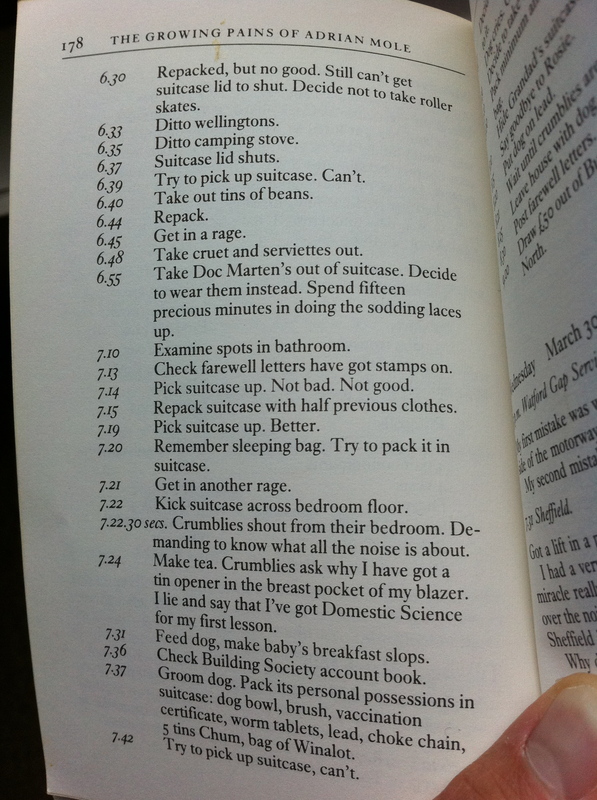 On the back of the book was the sentence: “A busy summer for Des”. I guess it was around this time that Lynam began to acquire the status of national institution, having already anchored all the biggest sporting events at least once and in doing so found the right pitch for his soon-to-be-trademark smooth patter. He does seem to have been all over the place in the summer of 1986, thanks to the World Cup, the Commonwealth Games and the European Athletics Championships. I would splash out on another bit of BBC-related Commonwealth Games merchandise before the Games were through, but more of that later. In the meantime here’s an all too brief excerpt of Des in his Commonwealth cubicle. and Sarah (now Duchess of York) Ferguson. muddled up in the vows. Watched TV from 9am to 6pm for the coverage. Despite my enthusiasm for this schedule-scuttling event, it seems I wasn’t up to watch such Breakfast Time special features as ‘Soon To Be Princess’ at 7.08am precisely, ‘The Abbey Awakes’ at 7.30am and ‘Across The Seas’ at 8.30am, wherein HMS Brazen “joins with a deck party in honour of their former shipmate”. Hmm, perhaps I didn’t much after all. The first thing I definitely saw was the slot at 9.05am entitled Dummer Delighted. Valerie Singleton and John Stapleton would have welcomed me and, by this point, a fair few million others, to the bride’s home village in Hampshire, before handing over to the colonies (in the shape of the Falklands) for some live starch-collared trans-continental bonhomie. And on it went. Like it or loathe it, I stuck with it. David Dimbleby namechecking the guests arriving at the Abbey; Selina Scott cooing outside Buckingham Palace; Mike Smith out and about among well-wishers in The Mall; Sophie Hicks, “fashion editor”, talking about hats. My diary implies that I also watched the film the Beeb slung out in between the kiss and the honeymoon departure: Living Free. This seems a very feeble choice in retrospect, but was presumably chosen by virtue of its content being open to the least amount of misinterpretation or sly insinuation whatsoever. After all, what possible symbolism was there in a film about a group of lazy, regal-looking beasts who spent their entire lives pawing each other while ferociously guarding their own property and warning off all outsiders with bizarre ritualistic flummery? 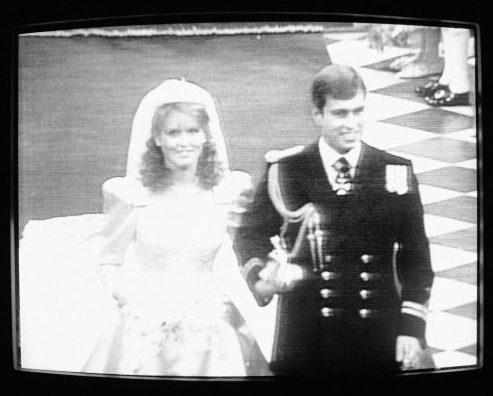 My nine hours of continuous viewing continued with Wacky Races, So You Want To Be Top and John Craven’s Newsround, climaxing with – gah- Heidi, whose total turgid televised exploits laid end-to-end would only just fall short of the entire length of Andrew and Fergie’s subsequent nuptials. At which point my dad got home from work and told me to turn the TV off.